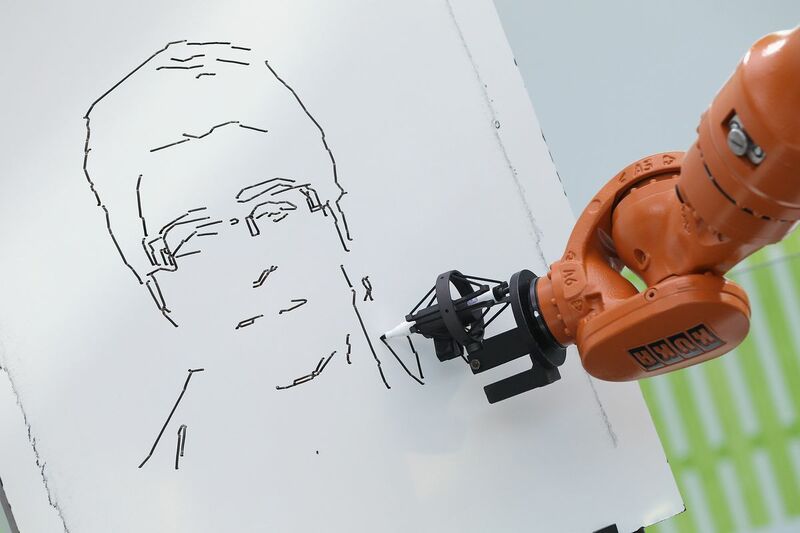 An industrial robot drawing a portrait, not playing Pictionary. But AI researchers say they have a tool that might help: Pictionary. Today, scientists from the Allen Institute for Artificial Intelligence (AI2) released an online Pictionary-style game called Iconary, which they say could help sharpen AI’s common sense. In Iconary, players must illustrate complex scenes like “a crowd celebrating a victory” or “kicking a tennis ball on a beach” while a computer program named AllenAI tries to guess what they’ve drawn. Most importantly: the AI has never seen these phrases before. The reason this is challenging for AI, says AI2 researcher Ani Kembhavi, is that it tests a wide range of common sense skills. The algorithms must first identify the visual elements in the picture, figure out how they relate to one another, and then translate that scene into simple language that humans can understand. This is why Pictionary could teach computers information that other AI benchmarks like Go and StarCraft can’t. Take the phrase “a family chatting in a kitchen,” for example. To depict or guess this phrase, you not only need to understand the elements that make up a family (parents, children, maybe pets and other relatives) and those that comprise a kitchen (pots, pans, a fridge, some food), but you also need to know how to show that the family is chatting and not eating. So you might want to avoid placing them around a table and so on. It’s a lot of information! This is also why Iconary is different to another AI Pictionary game that Google released in 2017 named Quick, Draw! While the latter is focused primarily on recognizing individual doodles, AI2’s game is all about combining these elements into something more complex. Iconary is not going to give computers the gift of common sense overnight, of course, but AI2 hopes the data it collects will be useful for future experiments. Collecting data from humans is particularly important for Pictionary as AI systems can’t play the game against one another to improve. With games like StarCraft, for example, researchers speed up the training process by pitting AI against AI in a sped-up environment. Each agent learns individual strategies within the confines of the game world, and the researchers pick the most successful agent to go forward to future fights. Because Iconary is trying to extract data that is fundamentally unknown to machines, it needs humans in the loop. “If you got AllenAI to play itself, it would develop a communication protocol that only it knows,” says Kembhavi. In other words, to speed up the guessing process, it would learn, over time, to sub in shorthand symbols for complex phrases. So the symbol ҂ might mean “drinking orange juice,” for example. “And then you’d deploy it in the real world, and you wouldn’t understand what it means,” says Kembhavi. This might be a comforting thought for those who are worried that AI systems will make humans obsolete. Not only do computers not yet understand the world like we do, but they need our help to improve.